Hellfest is a metal festival held annually in Clisson, France, and one of the biggest of its kind. This year (2017), with thenumber of attendees reaching more than 180,000, innovative logistical solutions were essential for ensuring that thefestivities ran smoothly for both guests and performers. 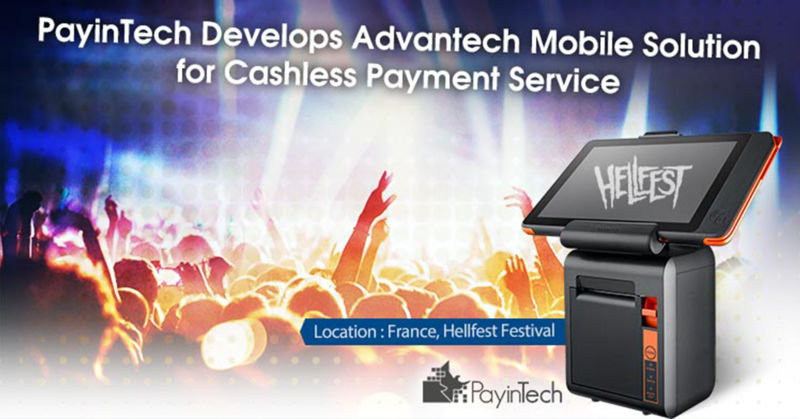 The French company PayinTech offered the organizers ofHellfest its payment systems software solution for convenient payment service. However, PayinTech found that mostconsumer-grade tablets either had insufficient capabilities to run their software or an inconveniently located NFCreader. The company needed more advanced equipment suited for high-volume commercial environments in order tofacilitate cashless payments at the festival. PayinTech established a collaboration with Advantech in Europe to create a suitable solution for the desired application.Advantech iRetail offered assistance with integrating their software solution, eventually determining that its AIM-37tablet with printer cradle provided the ideal hardware. Accordingly, Advantech provided PayinTech with a demo unit fortesting.